This three-day tour combines a relaxing two night stay in Inverness and includes a wonderful full-day excursion to the Isle of Skye! 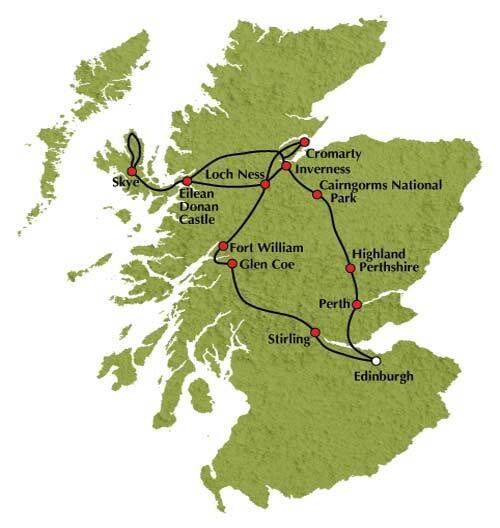 Join us for a special three-day tour through some of Scotland’s finest scenery. Relax for two nights in the ‘Capital of the Highlands’ and enjoy a full-day excursion to the magical Isle of Skye. As we leave Edinburgh we make our way to Rannoch Moor and then into Scotland's famous Glen Coe, witness to the MacDonald massacre of 1692. You'll have time to appreciate the magic and scenery of this special place. From Fort William we travel through the striking scenery of the Great Glen and its three lochs; Loch Lochy, Loch Oich and Loch Ness. We continue to the charming village of Fort Augustus then follow the entire length of Loch Ness. There is a stop at Urquhart Castle, where you can visit the castle and enjoy an optional short cruise on Loch Ness *. It's then just a short drive to Inverness, our home for the next two nights. Your stay in Inverness is unescorted, so you can enjoy your free time here as you please. From Inverness we make our way to the banks of mysterious Loch Ness. There is a stop at iconic Eilean Donan Castle *, which has featured in several movies and sits on an islet in Loch Duich. We travel 'over the sea to Skye' by way of the road bridge, rather than the ‘bonnie boat' of the song. After lunch, our route takes us along the beautiful coastline towards the moody peaks of the soaring Cuillin mountains. Our main stop of the day will be in Portree, the largest town on the island. After exploring bustling Sumerled Square why not take time out to explore the peaceful and picturesque natural harbour which is home to a fleet of fishing boats. We return to the mainland and the village of Kyle of Lochalsh. Our day excursion comes to a scenic close through Glen Carron to Achnasheen, from where it's just a short drive to Inverness and your accommodation. It's our last day in the Highlands so we make the most of it with a scenic drive through the Black Isle to visit the quaint fishing village of Cromarty. We later stop at Chanonry Point to try to catch a glimpse of the dolphins in the Moray Firth before another break in the lovely town of Beauly. Our drive through Glen Convinth brings us to the village of Drumnadrochit and for shopping opportunities at the popular Loch Ness Centre and Exhibition *. We rejoin our motor coach a little later in the afternoon for a spectacular drive south through the Highlands. From the Spey Valley and the Cairngorm Mountains we travel through Glen Garry for scenic views of the Duke of Atholl's family seat at Blair Castle. After a brief stopover, we continue through gentle rolling countryside towards Perth then on to Edinburgh. Tour Highlights: Rannoch Moor, Glen Coe, Fort William, The Great Glen, Loch Ness, Inverness, Glen Carron, Isle of Skye, Cuillin Hills, Portree, The Five Sisters, Beauly, Cromarty, Dolphin-spotting, Cairngorm National Park and Perthshire.